The next time you go to a professional firework display, see if you can count the number of different patterns in the sky. You might not know the names, but you’ll probably witness common formations including peonies, Roman candles, crossettes and waterfalls. You might even be able to make out special shapes such as hearts or smiley faces! But have you ever wondered just how fireworks are designed to burst into different shapes? The fuse, which determines how high the firework will climb into the sky before bursting. Explosive black powder made up of potassium nitrate, charcoal and sulphur. This is called a ‘bursting charge’ and makes the firework ignite when the flame reaches the end of the fuse. Stars – small lumps of metal salts that will burn differently coloured flames, depending on the metals involved. 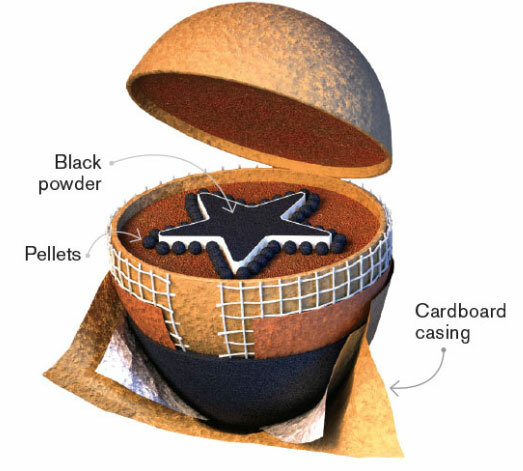 All of these key components inside the firework shell come together to affect the appearance of the fireburst. The fuse and bursting charge determine exactly when the firework will explode, while the position and arrangement of the stars inside the shell determine its trajectory when it bursts – and therefore the shape it makes in the air. It’s only fairly recently in the history of the firework that we’ve been able to manipulate them to make shapes in this way. 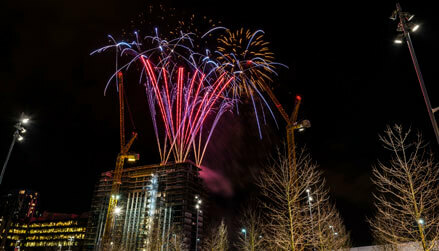 The first fireworks were primitive firecrackers that didn’t do much other than make a bang! But thanks to developments in science, we can now create some spectacular pyrotechnic effects. There’s no limit to the creative effects that can be achieved with the right specialist knowledge, but there are some old favourites that appear again and again. Peonies and chrysanthemums blast up on a rocket before bursting into a flower-like pattern of falling stars. Crosettes look similar but create multiple cross patterns in the sky. Fish fireworks move in a ‘swimming’ motion, propelled by a particular type of fuse. Cakes, sometimes called aerial repeaters, are a type of firework that fires a series of explosions one after the other. This effect is achieved by igniting a number of different Roman candles in sequence. Whether you’re after heart-shaped illuminations for your wedding or butterflies for a unique celebration, the best effects are always achieved with the help of a professional firework specialist. They can advise on the aesthetic effects you’re after, as well as ensuring that your firework display is completely safe.